With Bournemouth’s skyline continuously changing, one of the new buildings taking centre stage is Taylor Wimpey’s Coast development. 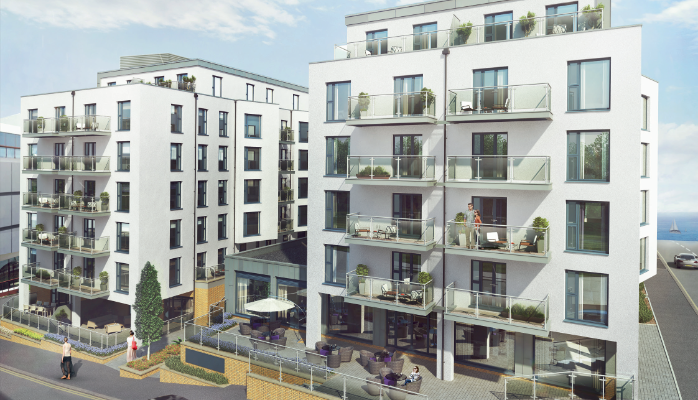 Situated on the site of the Bournemouth International Hotel, just behind the BIC, this new development boasts 86 new homes with underground parking and a glass-fronted restaurant overlooking Priory Road. The development has a mixture of one, two and three-bedroom apartments and penthouses with stunning views and the beach at your feet. pleased to have been asked by Taylor Wimpey to manage its flagship development in the centre of Bournemouth,” said Managing Director, Caroline Kelleway. Burns has been managing leasehold and freehold property in the Bournemouth and Poole conurbation for the past 40 years and the addition of Coast sits well in its portfolio. Specialising in the management of residential property has allowed the company to focus on the industry and provide its clients with good local knowledge and an excellent level of service, becoming one of area’s leading Property Managing Agents. and continuity at all times. “Having been a property manager with Burns for the past nine years, I have witnessed the steady growth of the company and am very excited to be part of it’s future,” added Andrew. Having recently been accredited as an ‘Outstanding’ agent, following its recent ARMA-Q audit, Burns Property Management has certainly demonstrated its commitment to providing the highest level of service and transparency to clients and this was recognised by the RICS audit team that conducted the in-depth review. “We work hard to ensure that we meet the standards imposed by the Association of Residential Managing Agents and the Royal Institute of Chartered Surveyors Residential Service Charge Code, and we are very pleased that this has been recognised. We would urge anyone appointing a manging agent to ensure that they are members of ARMA,” said Andrew.